Croissants. With batons of chocolate. I made these. Seriously. Yes I did. I can't believe it either. 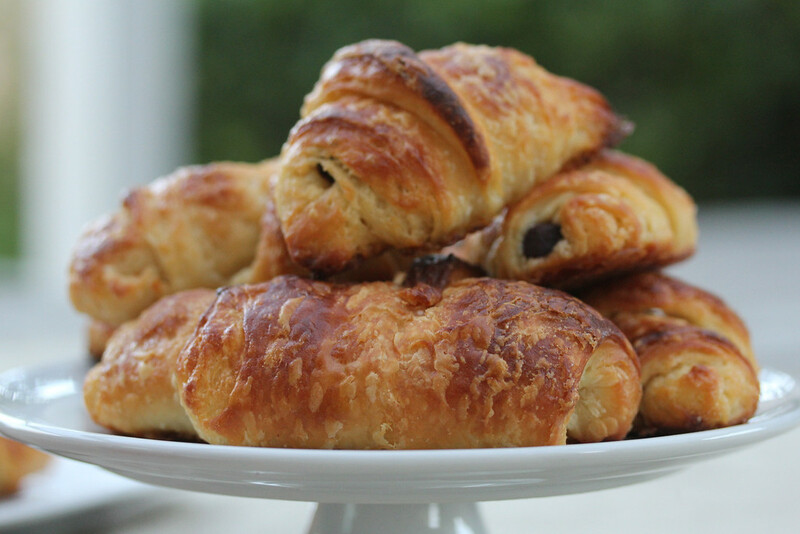 Croissants. One of the most intimidating doughs. Hey kids. Guess what? If I can do it, so can you. Crispy, flakey, chocolaty. Must make again, and again, and again. I am sure I made lots of mistakes putting this dough together... and yet, look at this flakey goodness! Adapted from and inspired by Girl versus Dough, adapted from How Sweet it Is. Both sites have gorgeous step-by-step photographs. Definitely hop on over to see them. In the bowl of a stand mixer, whisk the warm milk, brown sugar, and yeast. Let stand for about 10 minutes. It should be foamy. Add 16 ounces of the flour and the salt to the mixing bowl. Stir to combine. Knead with the dough hook on low speed for about 5 to 7 minutes. The dough should be smooth. Place the dough on a lightly floured surface and knead by hand for two to three minutes. Continue to add flour until the dough is smooth and no longer sticky. Do not add too much flour. I had to add very little even though it was a muggy day. Shape the dough into a 1 1/2 inch thick rectangle, wrap in plastic, and chill in the refrigerator for one hour. Place the sticks of butter next to each other on a piece of plastic wrap, top them with another piece of plastic wrap, and flatten the butter into a precise eight by five inch rectangle. I used a rolling pin and my hands to do this. Hitting the butter with the rolling pin and shaping the edges with my hands seemed to work pretty well. Take the chilled dough out of the refrigerator, unwrap it, and place it on a lighly floured surface. Roll it into a 16 by 10 inch rectangle. Make sure it is a rectangle and not an oval. Place the butter rectangle in the middle of the dough with the short ends of the butter parallel to the long ends of the dough. Fold each side of the dough over the butter. Using the rolling pin, gently at first, flatten the dough and then roll it out to a 15 by 10 inch rectangle. Fold the dough into thirds like a letter and wrap it with plastic wrap and place it in the refrigerator for one hour. After the fourth roll and fold, wrap the dough and place it in the refrigerator for six to twelve hours. 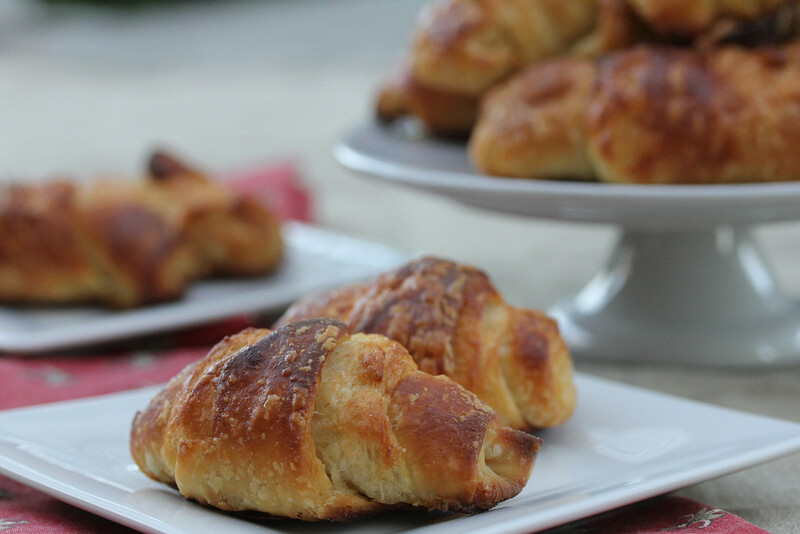 When you are ready to make the croissants, remove the dough from the refrigerator, unwrap it, and place it on a lightly floured surface. With a floured rolling pin, roll out the dough into a 20 by 30 inch rectangle. Using a pizza wheel or a bench scraper, cut the dough into 20 to 30 triangles, depending on how big you want your croissants to be. 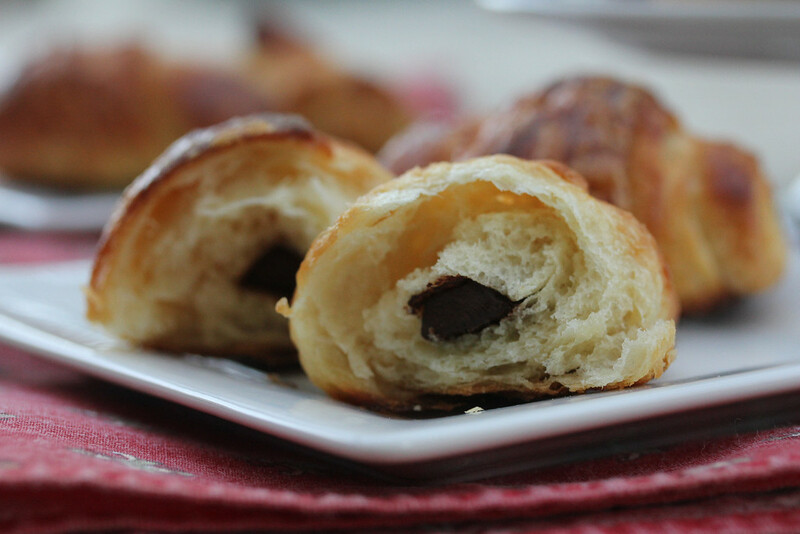 Place a small amount of bittersweet chocolate at the non-pointy end of the triangle, and roll up your croissants. 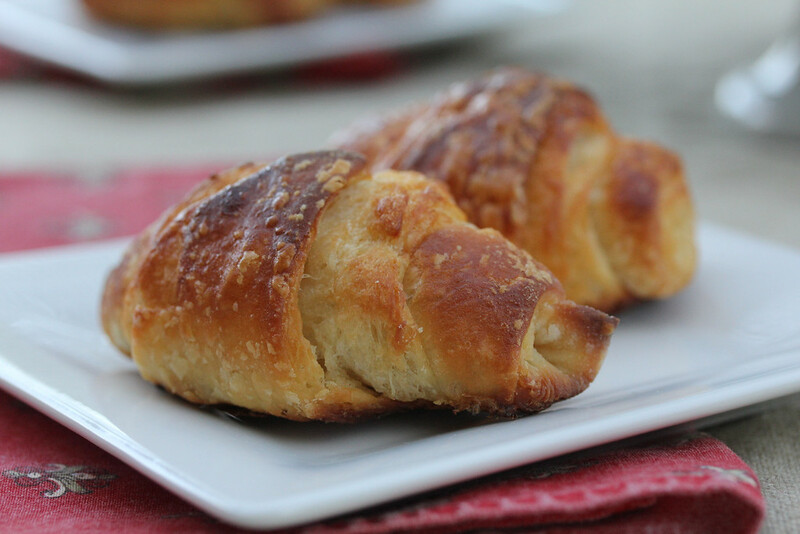 Preheat the oven to 450 degrees and brush each croissant with the egg wash.
Bake them, one sheet at a time, for 12 to 14 minutes. Let them cool on the baking sheet for about 10 minutes, and then transfer them to a wire rack. Keep any leftovers in a sealed container. To recrisp them, reheat in a 375 degree oven for about 8 to 10 minutes. This post has been submitted to Yeastspotting and Bake Your Own Bread and was inspired by this month's featured bread blog, Girl versus Dough. Oh Hanaa, thank you! Go for it. Seriously, they are quite forgiving amazingly enough.